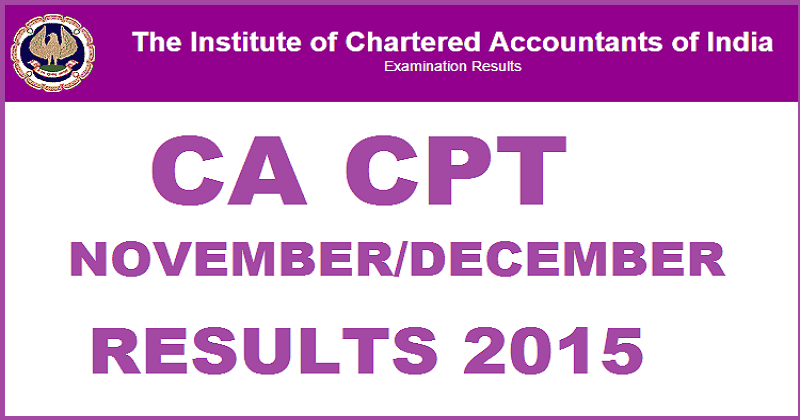 CA CPT Final Results 2016: The officials of the Common Proficiency Test (CPT) and Chartered Accountants (CA) has declared the result of their final written examination held last year, i.e., in 2015. All those aspirants who appeared have got their results published online. The aspirants who sat for the same were waiting for their outcomes to be released as soon as possible. Their anxious wait has come to an end with the announcement of the final result of CA CPT 2015. It is available online on the official web portal of the Institue of Chartered Accountant of India. You can follow the below-mentioned steps to know yours. You just need the name, PIN number and roll number or registration number to check the same. If you want to get your CA CPT 2015 result to be delivered to your inbox, first of all you will have to register your email id on the official website of CA. To do so, click on ‘Register here to receive the results in your mail box’. Then, look for CPT Results and click on it. You should have your roll number or ICAI registration number with you. One of them is mandatory to check the result. You will redirected to the screen where you can check your ‘cpt result’. You will get your result, Subjects in which you have scored more than 60% of marks would be exempted for the next 2 attempts. Enter your email address, name, roll number and then click on register. Soon, you will get it in your e-mail inbox as it is announced. There is one more step to complete the registration, you will be asked to enter the PIN number along with the roll/registration number. The CPT and CA exams were carried out by the Institute of Chartered Accountant of India (ICAI) across the nation. A very large number of students appeared for the same. Furthermore, the notifcation for the result will be made available on the Head Office of the Institute in Delhi. Stay tuned for latest Education news and updates. Don’t forget to share.